2014 wraps up my second full year of running my personal blog. Overall, I’m happy that I’ve been able to maintain the blog and consistently post content. One of my biggest worries starting a blog was that I would stop posting. I’m confident that I’ve overcome that hurdle, so now I can focus on other goals for 2015. Before getting into plans and goals for 2015, here’s a look at the performance for 2014 and how it compares to 2013. For 2014, I posted 73 entries. It was about the same number of posts as 2013 when I completed 71. Here is a breakdown by month. Here are the 10 most popular posts for the year based on number of pageviews according to Google Analytics. When the posts were written isn’t a factor, so some of these most popular posts may have been written prior to 2014. With book reviews taking 6 of the top 10 spots, it’s pretty clear what content resonates with Google Search. Also, the reviews have a “timeless” nature to them in that a few of those reviews were written in 2013. For the most part, I’m not going to let the popularity of content drive what I write. There are other things that drive the content of the blog which you can read about here. It’s just interesting to do the analysis and see what content is generating pageviews. For the year, the blog had almost 1,850 sessions. 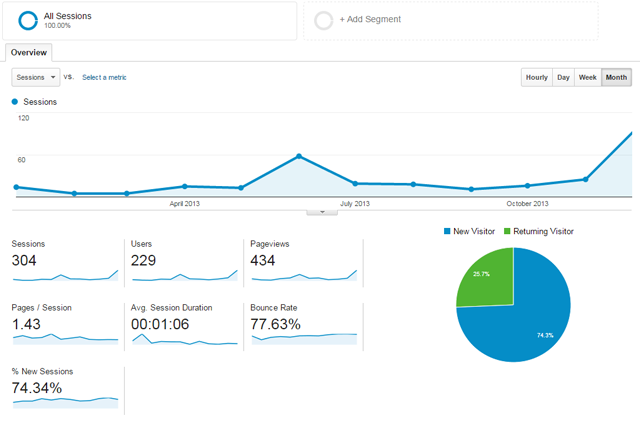 That an increase of 6x over 2013 when the site had just over 300 sessions. The traffic has steadily increased throughout the year with this past December having almost as many sessions as the entire year of 2013. For comparison purposes, here’s the 2013 traffic chart. I don’t really think there are any extremely meaningful changes to take from the two charts except for the traffic increase which I directly attribute to staying persistent and consistent with posting to the blog. I’ve found that the best way to drive behaviors you want is to write down and document your goals. For 2015, I’ve set three goals for the blog. I’d like to complete an average of 2 posts per week, which will give me just over 100 for the year. It’s a bit ambitious, but it is attainable if I stay focused. In addition to book reviews, general tech posts, and journal entries, I want to start a new category focusing on business, startup and bootstrapping lessons I’ve learned while running my own business. I know there are many sites covering the topic, but I want to document my personal experience for my own future reference. The blog’s design hasn’t changed noticeably since I started it. I’d like to do a bit of a refresh during 2015. There isn’t a driving force behind making the change, but it will force me to experiment and expand my knowledge of WordPress themes and customization. 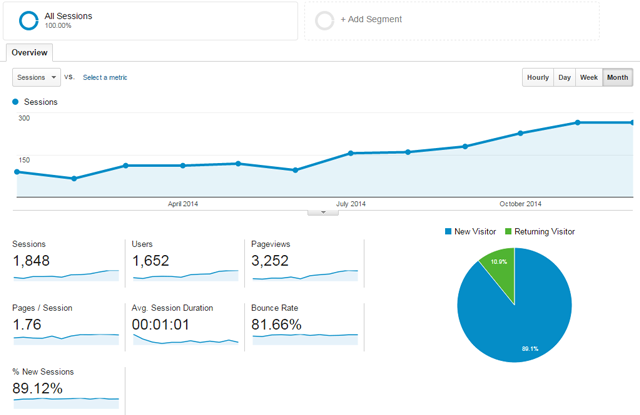 I’ve been pleased with the performance of the site for 2014. Now that I’ve put forth some concrete, written goals, the blog should only improve. I’m looking forward to what 2015 has in store for the site! This entry was posted in Life Journal on January 1, 2015 by Gregg Borodaty.